Sample items shown to illustrate design. A full range of clothing, mugs, hats, stickers and prints are available by following the link. 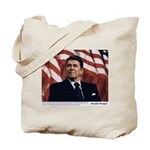 Reagan Collection: Get President Ronald Reagan with your favorite quotations. Reagan on Marx and Lenin: How do you tell a Communist? Well, it’s someone who reads Marx and Lenin. And how do you tell an anti-Communist? It’s someone who understands Marx and Lenin. Reagan on Liberal Ignorance: : It isn’t that liberals are ignorant, It’s just that they know so much that isn’t so. Reagan on “People’s Democracies”: The other day, someone told me the difference between a democracy and a people’s democracy. It’s the same difference between a jacket and a straitjacket. George Orwell on Pacifism: Since pacifists have more freedom of action in countries where traces of democracy survive, pacifism can act more effectively against democracy than for it. Objectively the pacifist is pro-Nazi. 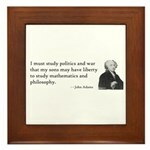 President John Adams Quotes – War: I must study politics and war that my sons have liberty to study mathematics and philosophy. Victor Davis Hanson: Our task — ordeal if you will — is that we must make war so godawfully terrible to our enemies, and the rewards of peace and reform so humanely sweet to our friends, that the vast middle in between will have no trouble choosing sides. 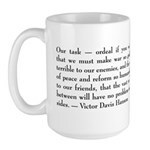 Pacifism Is Not The Answer: A response to the ubiquitous leftard “War is not the answer” bumper sticker.